Stanisław Szczepanowski or Stanislaus of Kraków (July 26, 1030 – April 11?, 1079) is the patron saint of Poland. In life, he was the Bishop of Kraków, known for opposing the cruelty of King Bolesław II the Bold, who reacted by causing Stanislaus' death. Born in the village of Szczepanów, Stanislaus became Bishop of Krakow in 1076. Traditionally he is believed to have been a man of particular holiness who famously raised a man from the dead to give testimony in court on behalf of the Catholic Church. He later became involved in the political opposition to Bolesław and excommunicated the king for his immoral conduct. Legends speak of the cruel king personally carrying out Stanislaus' martyrdom by hacking him to pieces. The only nearly contemporary source on Stanislaus' life is a chronicle of Gallus Anonymus, who refrained from writing details about the bishop's conflict with the king. Later sources are the chronicles of Wincenty Kadłubek and two (hagiographies) by Wincenty of Kielce, which contain much legendary matter. In the twentieth century, Stanisław become an important rallying point for Poles opposed to the tyranny of Communism. Pope John Paul II called Saint Stanisław the patron saint of moral order. Stanisław is venerated in the Roman Catholic Church as 'Saint Stanislaus the Martyr (as distinct from Saint Stanislaus Kostka). According to tradition, Stanislaus was born at Szczepanów, a village near the town of Bochnia in southern Poland, the only son of noble and pious parents, Wielisław and Bogna. He was educated at a cathedral school in Gniezno, then Poland's capital. Later, he studied in either Paris or Liège. On returning to Poland, Stanislaus was ordained a priest by Lambert Suła, Bishop of Kraków. After the bishop's death (1072), Stanislaus was elected his successor, accepting the office only at the explicit command of Pope Alexander II. Stanislaus was one of the earliest native Polish bishops. He also became a ducal adviser and thus had some influence on Polish politics. Stanislaus' accomplishments included bringing papal legates to Poland and the re-establishment of a metropolitan see in Gniezno. The latter was a precondition for Duke Bolesław's coronation as king, which took place in 1076. Stanislaus then encouraged King Bolesław to establish Benedictine monasteries to aid in the Christianization of Poland. Stanislaus' first reported confrontation with King Bolesław was reportedly over a land dispute. As bishop, Stanislaus had purchased for his diocese a piece of land on the banks of the Vistula River near Lublin from a certain Piotr. However, after Piotr's death, the land had been claimed by his family. The king ruled for the claimants, but–according to legend–Stanisław resurrected Piotr so that he could confirm that he had sold the land to the church. 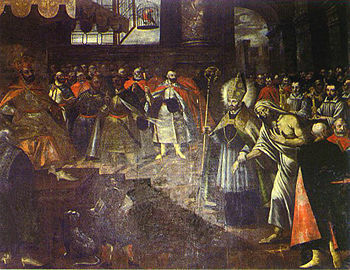 Saint Stanisław leads Piotr before the royal tribunal. According to the account of the eighteenth-century writer Augustin Calmet, Stanislaus asked the king for three days to produce his witness. The king and court were said to have laughed at the absurd request, but the king granted Stanislaus the three days. Stanislaus spent them in ceaseless prayer, then, dressed in full bishop's regalia, went with a procession to the cemetery where Piotr had been buried three years earlier. Then, before a multitude of witnesses, Stanisław bade Piotr rise, and Piotr did so. Piotr was then brought before King Bolesław to testify on Stanislaus' behalf. The dumbfounded court heard Piotr reprimand his three sons and testify that Stanislaus had indeed paid for the land. Unable to give any other verdict, the king then dismissed the suit against the bishop. Stanislaus asked Piotr whether he wished to remain alive, but Piotr declined, and so was laid to rest once more in his grave. A more realistic conflict with King Bolesław arose after a prolonged war in Ruthenia. Weary warriors began to desert the cause, alarmed at tidings that their overseers were taking over their estates and treating their wives as their own. According to to the early thirteenth-century chronicle of Wincenty Kadłubek, King Bolesław punished the soldiers' faithless wives very cruelly. For this he earned the courageous criticism of Stanislaus. The fifteenth-century historian Jan Długosz, however, wrote that the bishop criticized the king's own sexual immorality. Some recent historians hold that Stanislaus took part in a Bohemian-German plot designed to remove Boleslaw and replace him with his brother, Wladyslaw. 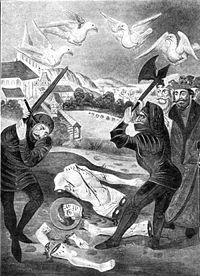 Gallus Anonymus condemned both "traitor bishop" and violent king. Whatever the actual cause of the conflict between them, the upshot was that Stanislaus excommunicated Bolesław. The excommunication aided the king's political opponents, and the king accused Stanislaus of treason. The martyrdom of Saint Stanisław. Some accounts indicate that King Bolesław sent his men to execute Stanisław without trial, while others hold that he was duly tried and condemned to be executed by dismemberment. The hagiographies state that the king's men dared not touch the holy bishop. The king therefore decided to kill the traitor himself. He is said to have slain Stanislaus while the saint was celebrating Mass in the Skałka outside the walls of Kraków. Another account indicates the execution took place in Wawel castle. The bishop's body was then hacked to pieces and thrown into a pool outside the church. According to the legend, his members miraculously reintegrated, while the pool was guarded by four eagles. The exact date of Stanisław's death is uncertain. According to various sources, it was either April 11 or May 8, 1079. The murder stirred outrage through the land and led to the dethronement of King Bolesław II the Bold, who had to seek refuge in Hungary and was succeeded by his brother, Władysław I Herman. Whether Stanisław should be regarded a traitor or a hero remains one of the classic unresolved questions among Polish historians. However, he was nearly universally revered for centuries by both the Polish Catholic Church and its political leaders until the modern era. The cult of Saint Stanisław the martyr began almost immediately upon his death. In 1088, his relics were moved to Kraków's Wawel Cathedral. In the early-thirteenth century, Bishop Iwo Odrowąż initiated preparations for Stanisław's canonization and ordered the writing of the martyr's vita. On September 17, 1253, at Assisi, Stanisław was canonized by Pope Innocent IV. Subsequently, Pope Clement VIII set the Stanislaus' feast day for May 7 throughout the Roman Catholic Church, though Kraków observes it May 8, the supposed date of the saint's death. The first feast of Saint Stanislaus in Kraków was celebrated May 8, 1254, and was attended by many Polish bishops and princes. As the first native Polish saint, Stanislaus is the patron of Poland and Kraków, and also of several Polish dioceses. He shares the patronage of Poland with Saint Adalbert of Prague, Florian, and Our Lady the Queen of Poland. Wawel Cathedral, which holds the Saint's relics, became a principal national shrine. Almost all the Polish kings beginning with Władysław I the Elbow-high were crowned while kneeling before Stanislaus' sarcophagus, which stands in the middle of the cathedral. In the seventeenth century, King Władysław IV Vasa commissioned an ornate silver coffin to hold the Saint's relics. It was destroyed by Swedish troops during The Deluge, but was replaced with a new one ca. 1670. Saint Stanislaus' veneration has had great patriotic importance. In the period of Poland's feudal fragmentation, it was believed that Poland would one day reintegrate as had the members of Saint Stanislaus' body. Half a millennium after Poland had indeed reintegrated, and while yet another dismemberment of the polity was underway in the Partitions of the Polish-Lithuanian Commonwealth, the framers of the Polish Constitution of May 3, 1791, would dedicate this progressive political document to Saint Stanislaus, whose feast day fell close to the date of the Constitution's adoption. Each year on May 8, a procession, led by the bishop of Kraków, goes out from Wawel to the Church on the Rock. The procession, once a local event, was popularized in the twentieth century by Polish Primate Stefan Wyszyński and Archbishop of Kraków, Karol Wojtyła. In 1979, the 900th anniversary of Stanislaus' martyrdom became the occasion of a major showdown between the Communist government of Poland and the Catholic Church, which ended Wojtyła, now Pope John Paul II, making a victorious return to his homeland as Pope. In iconography, Saint Stanisław is usually depicted as a bishop holding a sword, the instrument of his martyrdom, and sometimes with Piotr rising from the dead at his feet. Roman Catholic Churches belonging to Polish communities outside Poland are often dedicated to Saint Stanislaus. Pope John Paul II called Saint Stanislaus the patron saint of moral order, in addition to his role as the patron of Poland. History of "Saint Stanislaus of Krakow"
This page was last modified on 7 August 2015, at 19:38.